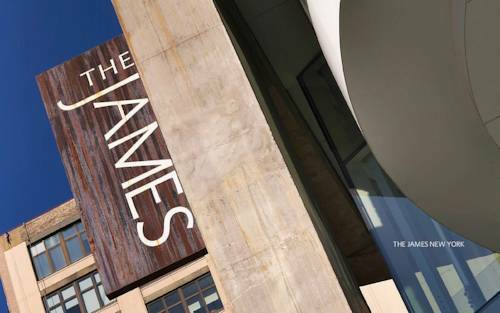 Ideally situated in the heart of Soho The James New York is a 114-room luxury boutique hotel. The space is conceived and designed as locally infused/artistically approachable and warmly modern. The hotel features expansive and unobstructed city views with a panoramic rooftop vista of both the East and Hudson rivers. Outdoor spaces include an Urban Garden and rooftop pool deck and bar. In homage to the creative neighborhood it calls home The James New York features a mix of local and national/international artists both prominent and up-and-coming. The Studio - a modern mixed use meeting space combining open and refreshing design features with the latest technology. The space includes state-of-the-art video conferencing and complimentary WiFi. The Studio - 500 sq ft of space - is flooded with natural light and opens to the Urban Garden - a 1000 sq ft terrace - for a unique indoor/outdoor meeting space with a private entrance on Thompson Street. The space can be set for a variety of events including corporate meetings / intimate weddings / rehearsal dinners / brunches / private dinners / cocktail parties / product launches. The Penthouse - featuring 1300 sq ft with stunning river-to-river views of downtown Manhattan this space is residentially styled with relaxed seating and inviting decor. It hosts a fully stocked wet bar and original works of art. In addition to complimentary Wifi the room boasts state-of-the-art sound and lighting systems which allowing for complete environment customization. Designed by world-renowned Dutch designer Piet Boon the stunning space is perfect for board meetings or intimate gatherings. All meeting spaces feature restaurant style dining and beverages with custom created menus available from our signature restaurant David Burke Kitchen. Located in SoHo on the corner of Thompson and Grand. The James New York acts as a beacon illustrating the juncture between the artistry of Soho and the industrial qualities of Tribeca. David Burke Kitchen serves breakfast - lunch -dinner daily as well as weekend brunch. The Penthouse Loft is a 1300 sq. ft. space featuring relaxed seating soft and inviting decor and original works of art.